Posted on December 15, 2013 by K. M. P.
I know what you’re thinking. It’s the clothes. Antonio Melani has the sharpest looking suits that fit nicely. The pants are always long in length and the suit jackets are always tailored nicely giving a professional sleek look to any office attire. If you don’t have the need for suits, Antonio Melani can make a dress! Remember the red dress I mentioned in Red But Not Roja? I ended up having a last minute invite to a Christmas Party, which I have to say was out of this world! It’s a wonder how some people can put a party together and make it look easy and elegant. Plus, having a most gracious and inviting personality is always helpful. Well, what did I wear? 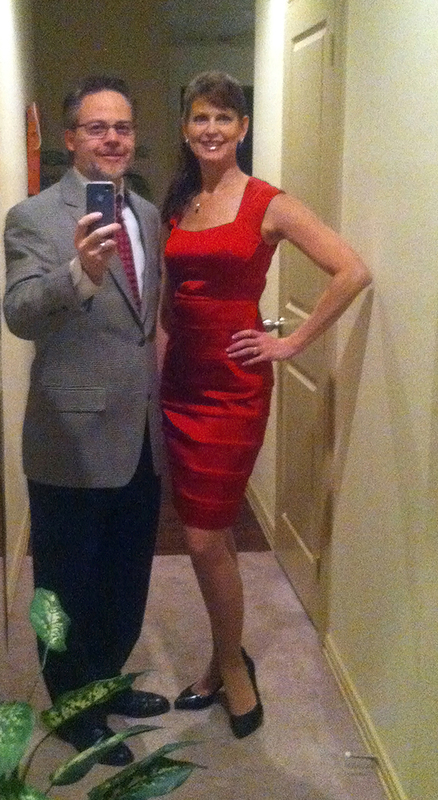 I ended up wearing my Antonio Melani red dress that was selected by Michael. He is my fashion mentor. He suggested the black heels from White House Black Market. The same shoes are no longer available, however they have plenty of hot shoes that will just make you go back for more! I completely agreed on the choice of shoes, because their shoes, clothes, and accessories are absolutely awesome!. And, if you haven’t been to the one in Sugar Land you have to go. Sara is the utmost professional, outstanding salesperson you could ever want. And, can she put together an outfit! She pairs up items as you look around, subtly choosing pieces that match with tops and skirts you selected while browsing the store. Posted on November 19, 2013 by K. M. P.
Keep it simple sister…………Simplicity can go a long way when we think Cowgirl Fashion. I’m not one to really like shopping and would rather sit at my computer working on a project. Shopping online doesn’t interest me very much because, frankly, there’s just too many choices. Luckily, my husband likes to shop so he will drag me around the stores. I saw this dress at Kohl’s, and I usually don’t purchase much from there, however I thought this might be a good candidate for black tights and boots. That’s what I like about winter in Texas. I get to pull out the textured tights. I can even throw a long tee on with my tights, slip on my boots, and I’m out the door. I have to say, you can wear just about anything with boots, especially in Texas. These Pink Taka boots can be found at Cowboy Boots NC and they have them for a fair price too. Any jewelry piece you have will most likely go with this ensemble, my preference is a little bit of turquoise or coral, and silver, of course. The piece shown here is a Native American authentic piece so you will pay more than just going to a store such as Charming Charlie’s, not to say you couldn’t find something just as cool to match up with this ensemble. I’ve found many affordable pieces for photo shoots to match specific colors, like the purple tank I’m wearing in a photo I’ll share this week. I think I’ll throw this fashion ensemble together and do a photo shoot since the mannequin didn’t do that dress justice. I look forward to another photo shoot with JMichaelp Photography.